If you read a handful of reviews of Narcos, Netflix’s new original show, before deciding whether to dive into its 10-episode first season, you would undoubtedly come across one point of critique and bafflement in just about every review: What’s with the voice-over? Narcos is heavy on the exposition and historical detail, most of which is delivered to the audience via voice-over from DEA agent Steve Murphy. In the season premiere especially, it’s intrusive, messy, and irritating. Sure, it’s a nod to Goodfellas, and Narcos certainly shows no shame in embracing mob- and crime-drama tropes, but it still feels out of place at first, a puzzling way to guide the viewer through the complex story of Pablo Escobar and the rise of cocaine in the 1980s. As the season rolls on, the voice-over not only becomes less prominent, but also serves as one of the more compelling ways the show adds depth and complexity to the narrative. Narcos pulls a bait-and-switch, using Murphy’s voice-over in the first episode to establish a traditional male antihero narrative, only to consistently and perceptively subvert that narrative with each new episode. Narcos is a sprawling show, one that tells a decades-long story set in multiple locations by focusing on the key players. The most prominent is Colombian drug kingpin Pablo Escobar (Wagner Moura), who, along with his various henchmen, quickly turns the country into the largest producer of cocaine in the world, running a highly profitable and increasingly violent operation that moves coke to Miami. Escobar’s foes are many. There’s the Cali cartel, a cleaner, less violent group that looks to infringe on Escobar’s empire. There’s the Colombian government, which, if it isn’t already in Escobar’s pockets, wants to see an end to his violent stranglehold on the country. Then there’s the Unites States government, which broadly includes Ronald Reagan and his War On Drugs, but more specifically includes DEA agents Steve Murphy (Boyd Holbrook) and Javier Peña (Pedro Pascal). Initially, Narcos uses its voice-over as setup. Murphy introduces himself, and then details everything that’s led to him being in Colombia. It’s an extensive account, moving from his hippie-busting days to the Nixon and Reagan administrations, finishing with his move to Colombia, where he’s on the frontlines of the war against the cartels. The show creates the assumption that Murphy is the antihero, the guy who may have to cross a few lines to get the job done. But if that means Escobar is captured and the cartel is destabilized, then it’ll all be worth it. It’s a narrative that’s familiar to anyone who’s been watching TV the last 10 years. Perhaps Narcos recognizes how tired these types of stories are because from there, the show completely subverts the formula and uses the voice-over to not only question Murphy’s actions and beliefs, but also critique the War On Drugs. By essentially positioning us “inside” Murphy’s head, Narcos make us complicit in everything the DEA agent does, however immoral, and also gives us insight into Murphy’s thinking. Initially, that means we see Murphy’s side of the story, and understand why the cartel and Escobar need to be taken down. The cartel is destroying Colombia, and shipping drugs into the U.S. only further substantiates their power, both politically and financially. As the season goes on, and Murphy’s actions become more questionable and innocent lives are lost, the DEA’s brand of rah-rah patriotism and justice comes under scrutiny. Narcos asks us to question Murphy and, more specifically, the toll of the Unites States’ War On Drugs in Colombia and at home. 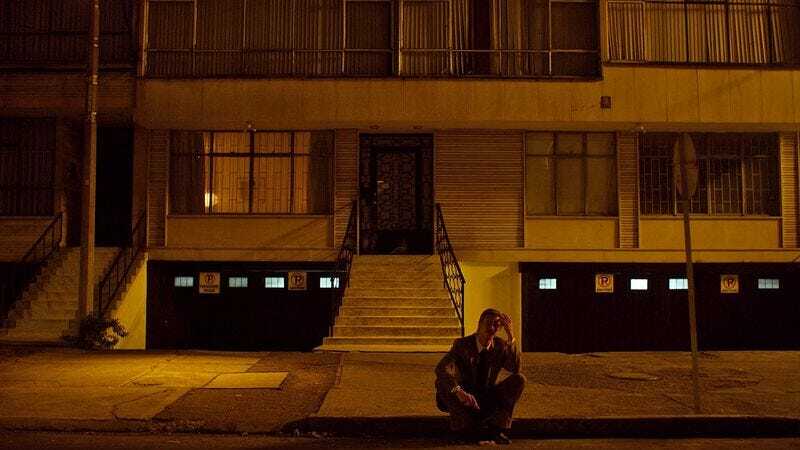 What Narcos achieves across its 10 episodes is a critique of form and subject matter, exposing Murphy not as a hero, but as a tool of the United States government. As many critics have pointed out, Murphy is a flat character with very little personality in his voice, but that only underscores how twisted his perspective is, and how much he’s influenced by the hyperbolic rhetoric of the do-no-wrong U.S. government. That twisted perspective peaks through in the earliest episodes, with Murphy lambasting the Communist M-19 group for “reading too much Karl Marx.” It’s one of the first signs we get that Murphy’s view, and therefore that of the government he serves, might be more complex than just wanting to control Escobar’s operation. After all, his throwaway comment about the Communists reading too much Marx would fit right in with the McCarthy witch hunts. Murphy is a product of his surroundings, which includes decades of questionable foreign policy. Narcos spends the rest of the season using Murphy’s voice-over to question his own morality, and by extension the morality of the War On Drugs and subsequent understanding of the U.S. as liberators. In many ways, Narcos explores how American intrusion into the politics of other countries, be it through political influence or actual military force, is more of a disruption than anything else. And what is Murphy’s voice-over if not an unwanted intrusion, a skewed, simplistic perspective on a complex issue? His lone English voice rises above the largely Spanish dialogue, making sure to “set the record straight.” Murphy’s voice-over says that “this is the way it is and should be,” which is the implication of any American occupying force in another country. The voice-over is the embodiment of American imperialism. Consider that when the Colombian government is hesitant to accept the help of a militarized American police force, Murphy tells the Colombian official that if “someone offered me a brand new Caddy, I’d say thank you.” Murphy thinks he and his colleagues deserve thanks for even taking an interest in this volatile country. Later in the season, after the innocent bodies have piled up and Murphy, for the most part, seems disaffected, the Colombian government ridicules him. The country’s minister of justice criticizes him and Peña for wanting to “parade Escobar around in your DEA jackets” before reminding him that, for the Colombians, “this is not a game.” Then there’s talk about how “the innocent people always seem to get hurt,” a line from the eighth episode of the season that’s underscored in the finale, where it’s revealed that an innocent woman was caught in the crossfire of a shootout that Murphy ordered. By the end of the first season, Murphy has been witness to and done some reckless things. The deceased are barely worth a mention in his voice-over. That’s because the death of innocent people doesn’t fit in with Murphy’s worldview, a perspective shaped by the ignorant rhetoric of the Reagan era and its defining, destructive policy: the War On Drugs. “We’re not a death squad,” declares Murphy, a little over halfway through the first season. A few episodes and countless innocent lives later, he’s sitting alone on a curb smoking a cigarette, that assured statement of patriotism undercut by numerous violent, careless actions. Reality has set in. The United States government has been lying to him, he’s been lying to himself, and he’s been lying to us.